Welcome to the 2016 RamNation Pigskin Pick’em Contest, sponsored by the Rams Book Store! 12/5/16–After grinding for 14 weeks, we finally have crowned our 2016 RamNation Pigskin Pick’em Champ. Heading into the final week, we had a three-way tie for first place between northbuff, Rams Hot, and rjeppson. But in a week in which much of the contest field seemed to struggle, Rams Hot stayed strong and posted an 8 which was good enough to secure sole possession of first place with 109 Contest Wins (factoring in throwing out each contestant’s worst two weeks) and 121 Season Wins (gross total). He concluded the season with a fantastic 57.9% winning percentage, which puts him at sixth place all time among contest champions. Rjeppson, one of the other co-leaders heading into the final week, managed a 7 to hold onto a spot in the top three, finishing in second place at 108 Contest Wins. He tied with Mdwatts who also finished at 108 Contest Wins, but Rjeppson owned 120 Season Wins to Mdwatts’ 117. Thus, rjeppson earns the $50 store credit and Mdwatts gets the $25. (Again, please email us to arrange collecting your prize.) Mdwatts made a nice run to finish “in the prizes”, concluding the season with scores of 11, 12, 9, and 9. Her 12 three weeks ago earned her a weekly win for that week. Unfortunately for northbuff, he was the odd man out, managing just 6 wins this week to fall out of the three-way tie for first and out of the prizes at fourth place. It was still the highest finish by a Buff fan in contest history. Despite being in 79th place going into Week 14, Ram Fan kept getting his picks in and was rewarded with the Weekly Win thanks to posting 10 wins, which tied him with Reecieram fan, but he won on the total points tiebreaker in the Penn State Wisconsin game. Ram Fan guessed 75 points to Reecieram fan’s 54 (actual total was 69). SappBVP, RamSack, and Rammie_5 finished the season on the lowest note, but posting Toilet Bowl-worth 4s this week. Unfortunately for the field, we fizzled out over the last four weeks, going 46.0%, 49.7%, 43.8%, and 45.7% in winning percentage. We were on pace to post the best mark in contest history (51.3% in 2010), but will now settle for fifth best all time (we were in third after 13 weeks) and marks the sixth time in contest history that we’ve finished above .500. We want to thank you all for playing all year long. Stay tuned for the RamNation Bowl Pick’em Contest, sponsored by Rams Book Store….in which we do the same thing, but with all 40 bowl games! Thanks to everyone for playing, and please join me in thanking Rams Book Store for their 16th year of sponsorship to this contest. 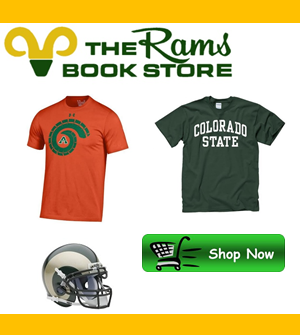 When you’re in need of CSU memorabilia, gear, or school books, Rams Book Store should be your first choice! Contestant’s should make their picks “against the spread”. For instance, if Stanford is favored by 16.5 vs. Kansas State, and Stanford wins by more than 16.5 points, they win “against the spread.” If Stanford does not win by more than 16.5 points, then Kansas State wins “against the spread,” even though they might lose the game.